If Landmarks designates the Riegelmann Boardwalk as a landmark, it will be Brooklyn’s third scenic landmark, joined only by Ocean Parkway and Eastern Parkway. The Riegelmann Boardwalk is named after Edward Riegelmann, who served as Brooklyn Borough President from 1918 to 1924 and is largely responsible for beautifying the Coney Island beachfront and undertaking the construction of the Coney Island Boardwalk from 1921 to 1923. 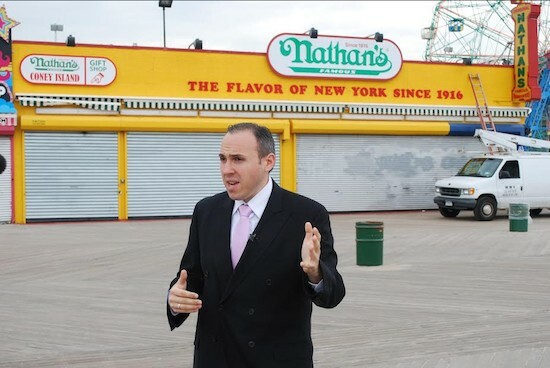 Council Member Mark Treyger joined community activist and Coney Island historian Charles Denson to file an application with Landmarks for the designation of the Boardwalk on December 2, 2014. Council Member Treyger subsequently introduced Resolution 0985-2016 at the full City Council’s stated meeting on February 5, 2016. Though the resolution would only be advisory in nature and non-binding on Landmarks’ actions, it has garnered tremendous support Citywide, including from New York City Public Advocate Letitia James. Council Member Treyger urges the public to show its support by attending and testifying at the Land Use Committee hearing on May 4, 2016, in the Council Committee Room at City Hall, beginning at 11:00 AM. Council Member Treyger is also urging the public to support the Boardwalk’s landmark-designation via social media by using the hashtag #LandmarkTheBoardwalk. Council Member Treyger sees the Coney Island Boardwalk as one of the “community’s most precious assets,” due to its status as a “cultural and social touchstone for all residents of Southern Brooklyn” for almost a century. In his view, officially designating the Boardwalk as a landmark would protect “its defining structural and aesthetic characteristics,” especially at a time when new development threatens the existence of historical, space-consuming structures. “We have already lost notable historic structures in our community to development because of our city’s sluggish landmarking system. We must ensure that what remains of our area’s past stays intact,” said Council Member Treyger. Council Member Chaim Deutsch, representing the neighboring Brighton Beach neighborhood, views the Boardwalk as important to Southern Brooklyn’s protection from the elements, in addition to its culture and history. “The Riegelmann Boardwalk is Southern Brooklyn’s first line of defense against floodwaters, and keeping it as a wooden structure is important for our resiliency. Our wooden boardwalk has survived many storms, including Hurricane Sandy, with minimal or no damage,” said Council Member Deutsch. “Coney Island’s historic Boardwalk is endangered, and if nothing is done, it will soon be transformed into an ugly concrete sidewalk,” said Charles Denson, director of the Coney Island History Project. Resolution 0985-2016 has also garnered support from New York State Congress Member Hakeem Jeffries, New York City Comptroller Scott M. Stringer, Brooklyn Borough President Eric L. Adams, New York State Senator Diane Savino, and New York State Assembly Member Pamela Harris. “Those classic wooden planks have witnessed New York legends ranging from Fiorello La Guardia and John Lindsay to David Dinkins—as well as millions from around the world who came to visit the greatest city in the world. Replacing them now would be akin to knocking down the Empire State or Chrysler Building,” said Congress Member Hakeem Jeffries. Borough President Eric Adams reflected on the Boardwalk as “a pathway to the carnival of Coney Island, connecting generations of memories” and a way of honoring the legacy of former Borough President Riegelmann. “The same wooden walkway that inspired writers such as Isaac Bashevis Singer and Neil Simon still inspires millions of people who enjoy its unique character,” said Borough President Adams. Senator Diane Savino commented on the Boardwalk’s status as an “iconic figure in the south Brooklyn community,” and praised the local Council Members for seeking its protection. City Council: Res. 0985-2016 (May 4, 2016).